To be honest I forgot why I went with the floating numbers (0.1, 0.2…) in the first place. Only when I started displaying damage numbers it kind of started bothering me. Dots and commas just don’t belong on the screen. They unnecessarily increase the size of the damage text. Even one of the reddit users pointed that out. You’re probably thinking that it was an easy task to transform most of the floating numbers to integers. Well… it wasn’t a rocket science, but I really had to change the values of every item, health and stamina of every NPC, shop prices etc. I bet you were wondering why there is a trophy inside the house. Its functionality is finally here! If you interact with it you’ll get the access to achievements, stats and leaderboards! I like to look at the stats in games and I have a feeling that I’m not the only one. It’s satisfying to see how many enemies and bosses you killed, what is your current level, highest score etc. Until now if you played the daily run your score was submitted to the leaderboards! The only problem was that you couldn’t check the daily score anywhere else but on the daily run’s game over screen. Now you can check the highest score of all time and the daily score also by interacting with the trophy! [HUGE] No more numbers like 0.92 etc. Majority of the numbers are now rounded and scaled to the integers (1, 2, 3..). [HUGE] Reworked rune generation. It’s way better! 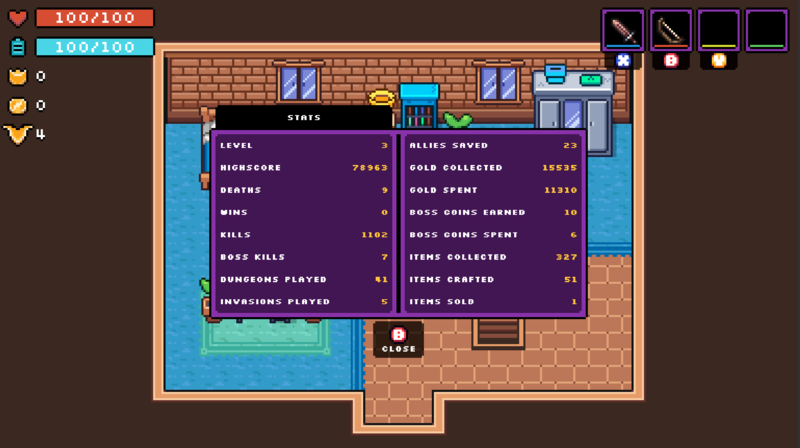 [FEATURE] You can now see your stats like level, enemies killed, invasions played by interacting with a trophy in the house. 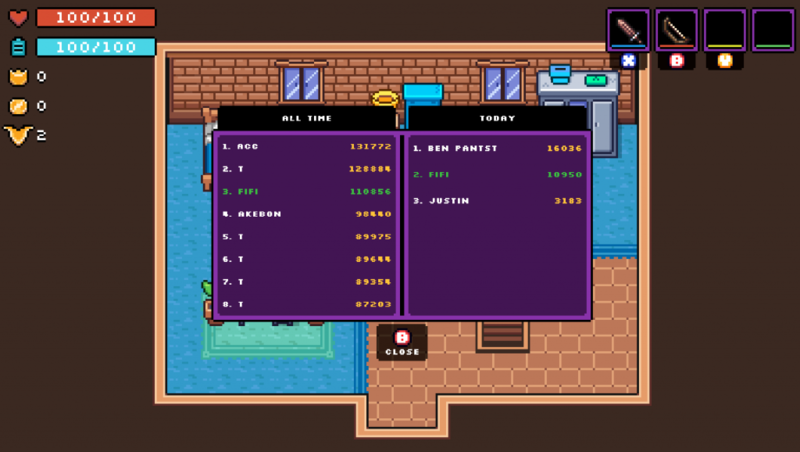 [FEATURE] Check out the best score of all times and daily run leaderboards by interacting with a trophy in the house. [MINOR] Mobs now collide with each other. They can surround you more easily. [MINOR] Added information icons for weapon usage in the HUD! [MINOR] Fixed couple of pixels in the “Pot Hater” skin. [MINOR] Added more structure and starting rooms to the invasion. The layout of invasions are now more interesting. [MINOR] Damage numbers don’t appear anymore when you break pots etc. [MINOR] Added option “Nothing” to Zoe. [MINOR] Added the “Best played with a controller” screen. [MINOR] Secret library is resized to a normal size. [BALANCING] Jolt, Jolt Volt, Jolt Volt Bolt now have reduced cooldowns. [BALANCING] Buffed the vampire rune. [BALANCING] Buffed bubble turret’s attack rate by 20%. [BALANCING] Buffed triple turret’s attack rate by 25%. [BALANCING] Information about the item now appears in 0.5 seconds instead of 1. [BUGFIX] Fixed double healing numbers on life steal attacks. [BUGFIX] Sizzles and Cobras are now only immune to poison. [BUGFIX] Fixed the bug where you could interact with zoe even if she already gave you a reward. [BUGFIX] Fixed pressure plates spawning outside of the dungeon. [BUGFIX] Everything on fire now has 80% chance of spreading the fire between nearby enemies, companions etc. [BUGFIX] Changed the rune in “Dundee” perk. [BUGFIX] Fixed the bug that wouldn’t play secret room’s open door animation. [BUGFIX] Crates in invasion which are used as buildings don’t give you score anymore. I’m starting to think about the release date. March 1st seems tempting. What do you think? Until next Friday I wish you happy dungeon crawling! 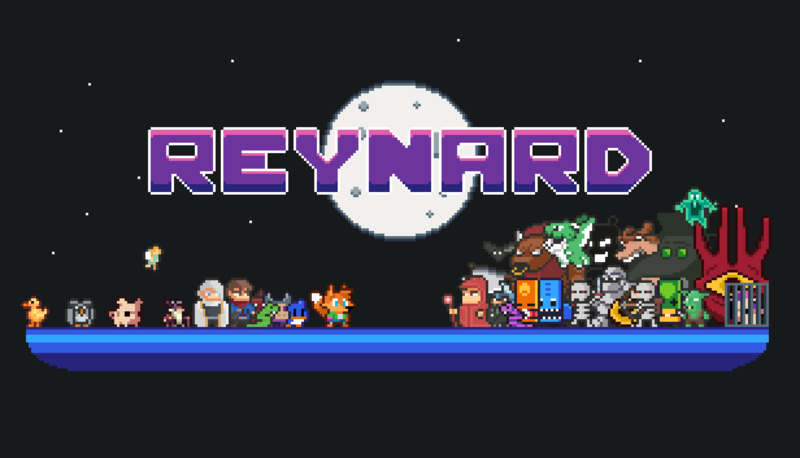 PS: Reynard is 20% OFF!